Last weekend, I played Tsuro of the Seas for the first time, and loved it. It was beautifully simple, and well-crafted. Lots of fun. Anyone else tried it? I have not. I love tile-laying games and that's one that I thought looked fun. A friend introduced my wife and I to Stone Age last night. It was our first proper Worker Placement game. It's pretty straightforward but it was fun. My wife was a big fan. We're realizing that we really like games in which you build things. Even if you lose you have this thing that you've built up. It can feel rewarding. My wife and I played Stone Age for the first time not too long ago as well. I enjoyed it, my wife didn't. Worker placement games can be a lot of fun. While it's starting to show its age, Caylus is a really cool and elegant game. Uwe Rosenberg's Agricola is probably the best worker placement I've played. I own his Ora et Labora, which is great (I love the theme and solo aspect), but it doesn't quite match up. Thinking about taking the plunge into Android: Netrunner soon. I'm a little hesitant because I'm not sure how much my primary gaming partner-- my wife-- will enjoy it. I've described it to her as best I can and she seems interested. I know there's a steep learning curve and lots of jargon and I've tried to prepare her (and myself) for that. Any of y'all play it? Do your wives? Is there lots of fun to be had in just the Core set? Seven Wonders is a great game, FWIW. Everyone I've introduced it to so far has gone on to buy it. 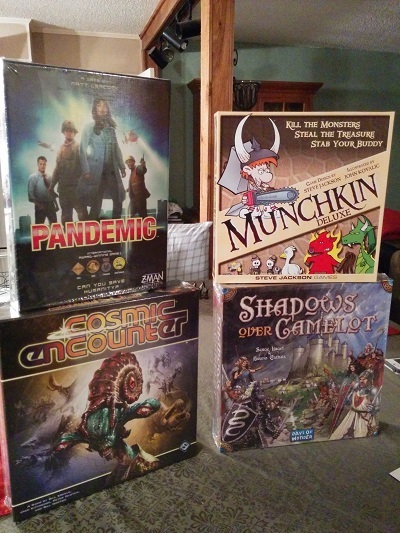 My birthday is coming up and I decided I'm primarily going to ask for board games. I'm looking for stuff that would be a bit more light so my family would enjoy playing it. Not necessarily party games, but something that doesn't have the complexity of something like say Battlestar Galactica. They play and like Settlers of Catan. I'm already asking for Munchkin Deluxe, Small World, Alhambra, Forbidden Island, Carcassone and Pandemic. I'd want the player range to be 4-6. Recommendations? Seven Wonders; Ticket to Ride; Rampage is fun. You'll love Alhambra and Carcassone. As still a relative newbie to the boardgaming hobby, the first designer that I've called a "favorite" is Antoine Bauza based on the merits of Ghost Stories and Hanabi alone. So 7 Wonders is definitely on my radar. I'd heard it doesn't play well with two but then Richard Ham (of the increasingly popular Rahdo Runs Through) thinks it plays best with two. And I've grown to really appreciate and trust his opinion. All those games sound perfect for what you're looking for. I'd be remiss if I didn't recommend my favorite game, Dominion. It fits what you're looking for while providing a different flavor than everything else on your list. Lots of replayability in the base set plus tons of great expansions out there if you really get into it. Ticket to Ride is also a pretty standard family board game (recently replaced Settlers of Catan as the current top dog in sales, I think). Once you get tired of the regular board there are some map packs you can buy that are really tough. From my experience with my kids, I'd put in a strong recommendation for Ticket to Ride and Munchkin. They never really got into Carcassonne, much as I've enjoyed it. Ticket to Ride is competitive but not overly so, and my kids have dug it from about age 10 onwards. Munchkin has a great sense of humor that my sons have gotten a big kick out of, from about age 11 on. I kinda fatigued on Ticket to Ride. I played the PC version a ton with friends, but it might be more fun playing the physical, tactile version. Someone else mentioned Seven Wonders on twitter, so I'll add that to the list as well. And while Rampage looks fun, knowing my family, any dexterity-based games will end in pieces flying all across the room. They're an enthusiastic bunch. Dominion looks interesting. I guess what got me is the volume of cards looked a bit daunting, but I'll add it to the list based on the high recommendation. Oh yea, I should mention that my younger siblings are in their mid teens, so it would be adult level comprehension. It's more that my parents have a hard time keeping track of lots of rules in games and I didn't want to pick games with an overwhelming amount of mechanics. In search of a good, relatively light but still strategic 2-player game, my dear wife and I purchased Babel and played it a couple of times over the weekend. It took a little time to win us over, but win us it did, and in a big way: Highly recommended for anyone looking for a reasonably quick, confrontational game built for two. Looking back through this thread, I noticed that I mentioned 7 Wonders in the first post! So over two years after I posted that, I can still say that game is fantastic. It's really replayable, and there are enough paths to victory that each game feels pretty unique. The expansions are all excellent too. I don't know if I agree with the notion that the two-player version is the best, though, since the game finds its sweet spot around five players, in my experience. I'll go ahead and add my praise to the chorus for 7 Wonders - it's great not just because you can finish a game within 30 minutes, but the payoff of winning using completely different strategies each time you play is fantastic. Carcassonne is great, and a welcome change of pace from other traditional board games, but I find the expansions necessary to keep it fresh. Dominion is daunting at first, and it takes a while for the gameplay to be fluid, especially when playing with beginners, but it's well worth it. To add one that I don't believe has been mentioned yet, Game of Thrones is one of the better modern strategy games out there. Similar in gameplay and table talk to Diplomacy, but faster paced and with a few more random variables and complexities. 3-6 players, very easy to learn, and creates some very interesting dynamics between players. It also doesn't require any knowledge about the series (it was actually my first exposure to A Song of Ice and Fire, and it was made in 2003, well before the show, so it has a unique aesthetic and design based on the books, not someone else's adaptation of them). Highly recommended, especially as a middle ground between Risk, which can get rather dull, and Axis & Allies, which can take days or even weeks. I go between Risk and Monopoly as the board games I hate the most. I think Risk wins out just because the interaction between players is so dull and everything is resolved by unmodified die rolls that usually boil down to either the attacker having enough brute force behind their attack to beat out the odds or the defender praying for enough high rolls. 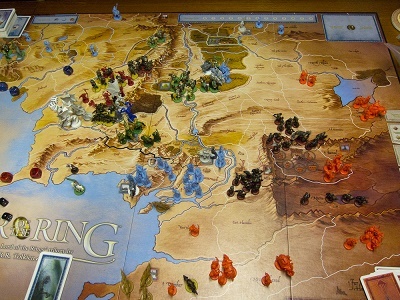 I do think The Lord of the Rings Risk goes a long way to fixing some of my problems, especially since there's an endgame that makes most games last about 1-2 hours and the leaders/strongholds additions gives you a bit more tactical consideration. Add in the event cards and the game becomes a lot more dynamic. However, just that core bit of having to constantly roll dice to resolve combat ends up being tedious to me. I'ts been years since I've touched Axis & Allies, but what I always hated about that game is that the map seemed unbalanced, meaning that certain countries would come into conflict really early and I played several games where I got eliminated in the first 30 minutes (one time, before I even got to have a turn) because of that. I did like that you had units that modified what you needed to roll to win combat, I thought that was way more interesting than Risk, but the map layout really killed most of my game experiences with that title. I have way more negative memories of that game than positive ones. Hunted down and bought a copy of War of the Ring. It's out of print, took me a while to find it, but I went for it. Wasn't cheap. Hope I like it. This one? If so, this is the first fantasy game I ever bought. I think I still have it, though I couldn't swear if I have all the tiles or character cards. For folks bored with Risk, have you tried Risk: Legacy? Also, Shut Up and Sit Down posted a game that gives you a bit more knowledge. Always on the lookout for good, quick, not-too-confrontational 2-player games to enjoy with my wife, I purchased Jaipur the other day, and received my copy just minutes ago. Who here has played it? Also got Power Grid (not pictured because I got it earlier in the week). We played Power Grid last night and Munchkin tonight. Power Grid is a game where I think I'll appreciate the complexity the more I play it. First time was kinda just figuring out the rules and screwing up the order. However, on the first play-through, I could see the brilliance of the design. You have to struggle managing three different resources to expand, meaning each turn you have to plan out how you spend your money. You can pick up the great plant and then realize you can't reach it's full usage for two turns because you have to buy resources to power it and then the connections to get payment for the power. On the other end of the spectrum, Munchkin is a game where nothing ever goes as planned. It was a blast playing this with my family as we constantly messed with each other, forced tenuous alliances and then basically have all but one player right before the finish line vying for that last monster battle. One great moment my sister thought she had an unstoppable combo, but we played enough cards to keep her from winning, just barely. There was a stack of 10 cards in play right by the monster. The best moment was when my brother took a risk and fought a monster where if he lost we got to loot him for gear. He barely lost and we laughed with glee as we each went around and stripped him of gear. We're a loving family. Haven't played it, but I read some reviews and the game looks like a lot of fun. Have you had a chance to play it yet? I have, Jason, and am happy to report that my wife and I both loved it. It's a remarkably smooth, seamless, intuitive, and quick little game: We were playing it within 10 minutes of opening the box and reading the instructions, and we've found that a game usually just lasts 20-25 minutes or so. I would highly recommend it for anyone looking for a fairly laid-back, non-confrontational 2-player game (really, it's about as confrontational as Carcassone).